TERRORISTS KILL OVER 345 CIVILIANS and no actions from the World?! The death toll now stands at 345 killed, and over 1450 are injured. The failure of the Muslim rulers to respond to the aggression carried out over the years by non-Muslim states against the Muslim Ummah has exposed the betrayal of the Muslim rulers. Published figures show that the Muslim armies combined outnumber the Israeli forces by a ratio of 68 Muslim soldiers to one Israeli soldier. The Muslim countries spend almost 17 times more on their military budgets than Israel. So it is clear that a united Muslim armed force is the dominant military power in the region. Even with their advanced military technology, the Israelis cannot overcome such a large military force. Also, after a brief glance at the borders of Israel, it is clear that it would be virtually impossible for Israel to defend itself from a simultaneous land offensive from Egypt, Jordan and Syria. You may be wondering have not these states engaged in a war against Israel before. Yes they have, but those wars were in reality `scenario wars’ with the objective of seeking peace with Israel. This was mentioned by Mohammed Heikal’s in his book “The Road to Ramadan” – he quotes one of Sadat’s generals, Mohammed Fouwzi who gave the analogy of a samurai drawing two swords – a long one and short one in preparation for battle. Fouwzi said that this battle (the 1967-six day war) would be a case of the short sword, signifying a limited battle for certain motives. Indeed, this gross betrayal by of the Ummah by Egypt is currently matched by Turkey who assists Israel in her military exercises. As a Turkish news agency stated; “Billion-dollar military agreements, intelligence cooperation, maneuvers and secret operations are being made between Turkey and Israel. Israeli war planes are flying over Konya. A common missile shield project is on the agenda between the two countries; it’s under consideration for the missiles to be located on the borders of Iran and Syria. In a 20 thousand square kilometer area in the Konya valley, there were maneuvers of hundreds of planes making a nuclear attack. Dozens of examples like this can be shown. In short, Turkey is Israel‘s friend and ally” – (http://www.zaman. com/? It may be stating the obvious but the Israel is land, sea and air locked by the Muslim countries. So Israel is dependent on the Muslim countries for its survival and for access to the outside world. What would be the impact of a Sea, Land and Air blockade? 1. Is Isreal a part of the UN? 2. Why isn’t America stopping the bombing of civilians? both sides the same weapons and let them get on with it? 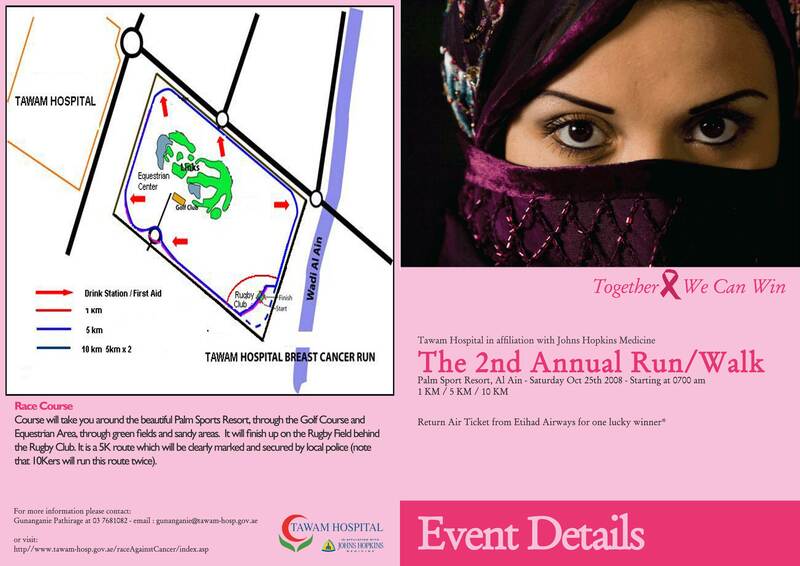 The 2nd Annual Run Walk for Breast Cancer Awareness will start at the Al Ain Palm Resort Rugby Club tomorrow Saturday 25th October 2008 at 7.00am. 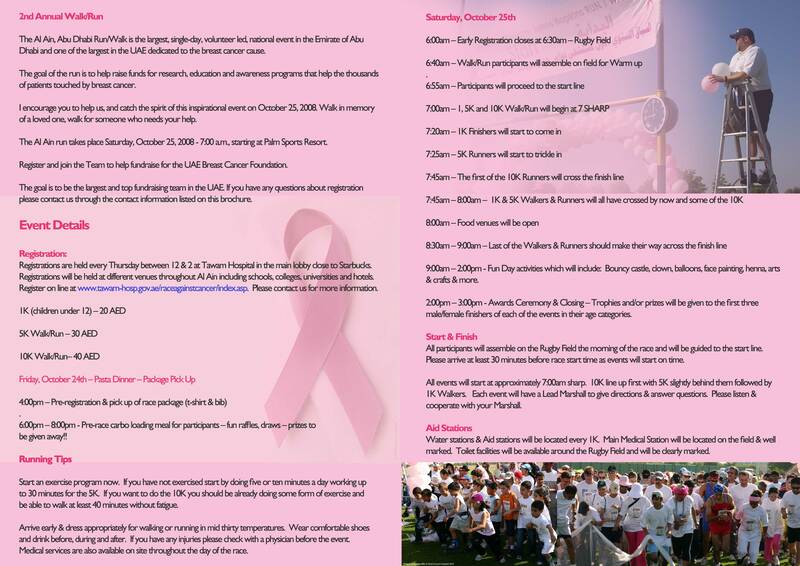 The Fun Day will offer a raffle sponsored by Etihad Airways and lots of Fun Activities. Besides bouncy castle, clown, balloons, face painting and henna many Artist & Crafter are exhibiting their creative work and offer them for sales. from 12 noon – 7pm. Gifts, unique decorations, art & photography as well as individual created pieces of jewellery will be offered directly from the artisans. If you would like to try your hand at knitting, embroidery, scrapbooking or a variety of other arts and crafts, there are plenty vendors who offer it, plus the supplies needed. Location plan can be found here www.timesquarecenter.ae and further information can be sought at info@arte.ae .